One of my duties at work is to serve as liaison to the History Department. It's a bit tricky because I do not work with people in the department who do Latin American history because we have a Latin America and Caribbean (LAC) specialist who plucks those researchers, leaving me with the rest of the world. Given my location in Miami, Fl., it is understandable that most of the research conducted in the department is LAC oriented. However, in my searches I realized that a section of the community is gearing up for one big event: The Centennial Commemoration of the U.S. involvement in WWI (The Great War). So I put together a research guide on that topic with a colleague and in the course of my research I came across Joseph Loconte's book. Any time you can bring Tolkien and Lewis into the conversation, you do it. Immediately. So this background, coupled with the fact that Barnes & Noble keeps settling lawsuits by sending me in-store credit, drove me to this book. Note the tag line on the cover, "How J.R.R. Tolkien and C.S. Lewis rediscovered faith, friendship, and heroism in the cataclysm of 1914-1918." This is a very accessible book. It reads very much like a conversational lecture. Lecture because it is clearly structured to be informative. Yet, conversational in diction and in it's explanatory mature. It is an easy read. It contains just over 200 pages of content, making it an easy weekend reader if you have that kind of time to devote to reading. For this, and for excellent content, I give the book a five-star rating. It simply is a great book for historians and inklings alike. Loconte begins the book by describing the pre-WWI world attitude towards scientific progress. Technology improved man's lifestyle enormously. Science was learning new things and implementing them for man's benefit constantly. The industrial revolution made the future look brighter than ever. This also reached into philosophy when men took Charles Darwin's Evolution of Species and ran it through to an extreme conclusion when applied to mankind. Thus, the idea that man is also evolving and improving with every generation. Loconte calls this "The Great Myth." The Great Myth has many implications. The first of which manifested itself in the notion that evolving man will be able to negotiate peace without conflict and, eventually, wars will shrink in magnitude and carnage until it disappears altogether. But to achieve this peace—this ultimate state of evolution—man must help nature by participating in a program called Eugenics. Essentially, Eugenics is natural selection applied to mankind where only the best human specimens are allowed to breed. There seemed to be no stopping this train of thought. Steam engines, railways, light bulbs, etc. all provided great conveniences to mankind. Science was not something that could be argued against. So the church did not. Here, we get the rise of Liberal Theology, which went along with science and called for increased eugenics programs and sought to bring the kingdom of heaven down to earth's level. It's a nice idea, though clearly unethical by today's standards. This wave of theology is what Tolkien and Lewis was dealing with. But WWI smashed The Great Myth to pieces. Instead of eliminating conflict, Europe was embroiled in it. Instead of limiting the scope of conflict, the entire world was engulfed. Instead of minimizing casualties, this secular war killed more men than any previous war could have even conceived. Both sides, believing in this Myth, believed they would leverage new technologies and bring a swift end to the war. New machine guns, mustard gas, trench warfare, and naval improvements, unchecked by ethical restriction, mowed soldiers down with frightful speed and force. This is the conflict that Tolkien and Lewis fought on the front lines and survived. Not only does the brutal experience of war inform their writings, but also the disillusionment that follows. After the war, mankind saw The Great Myth as a failure and subsequently lost all hope in this life. Tolkien and Lewis also fought to restore hope. Hope in the living God who moves in this world. They do this by creating their own mythologies that echo the Romantic myths they adored and, ultimately, echoes the True Myth delivered to man in the scriptures. I suppose I could continue writing, but I will not give up everything Joseph Loconte has written on the subject. Know that he goes into greater detail and provides more supporting evidence of The Great Myth and on the great casualties sustained during the battles of WWI. 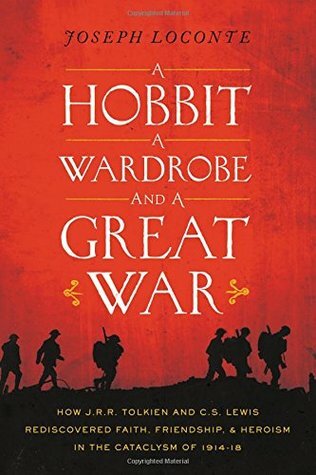 He also weaves passages of The Lord of the Rings, The Chronicles of Narnia, and The Space Trilogy throughout the book, showing how the war absolutely influenced their respective author's writings. I wholeheartedly recommend this book to anyone interested in history, literature or theology as this book touches on each of those topics. SIDE NOTE: Loconte dwells on TLOTR more than Lewis' works as it is written for a more mature audience and displays some of the gruesome details not found in Narnia.